Having been a Manfrotto® fan myself, for quite some time in the past, I can understand the dilemma of numerous Manfrotto gear users that would like to taste the freedom of an Arca-Swiss® compatible system, but on the other hand are very thoughtful of their investment. By jumping to an Arca-Swiss compatible system changing only a clamp or the ball head will not be enough. All extra camera and lens plates purchased will be useless. 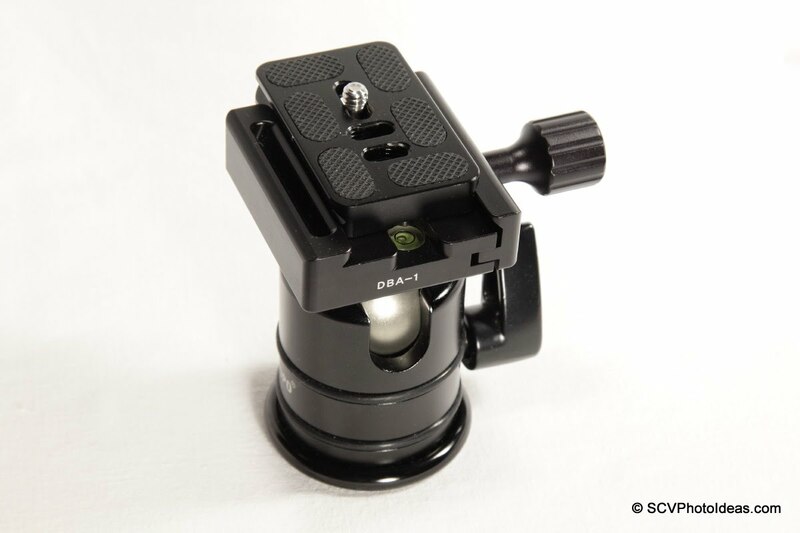 However, that was the situation up to now, as Desmond has produced a Quick Release clamp compatible with both the Arca-Swiss and the Manfrotto RC2 quick release systems. Desmond Photographic Distribution is based in the USA, and as the name denotes is engaged with the distribution of photographic support equipment, lighting gear, tools and parts for a long time. They are mainly known in the US wholesale market, where among other brands they distribute Marumi filters and more recently Sunwayfoto support gear (where I owe the acquaintance actually). In 2010, they decided to come out with their own brand-named products, in an effort to control production and quality inconsistencies met with low budget Chinese manufacturers up to then. Desmond brand aims to the budget segment of the market while preserving quality standards. 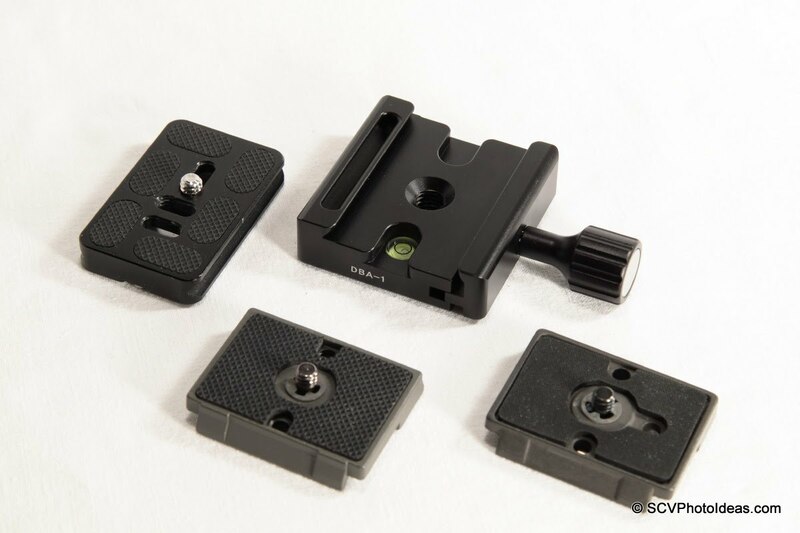 Among their line there are clamps, camera plates, leveling plates, flash brackets and tools. 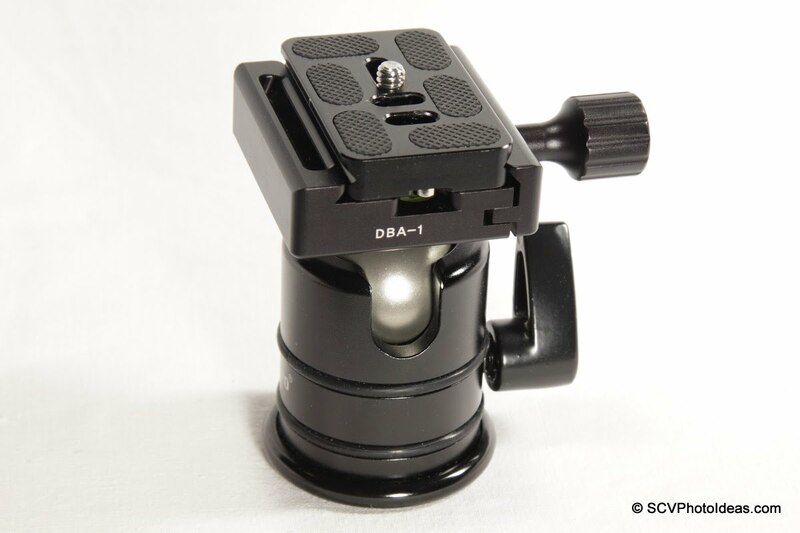 One of the most innovative products in the Desmond line of clamps is the DBA-1, unique in design by accepting both Arca-Swiss® compatible and Bogen® 3157N / Manfrotto® 200PL-14 compatible plates. 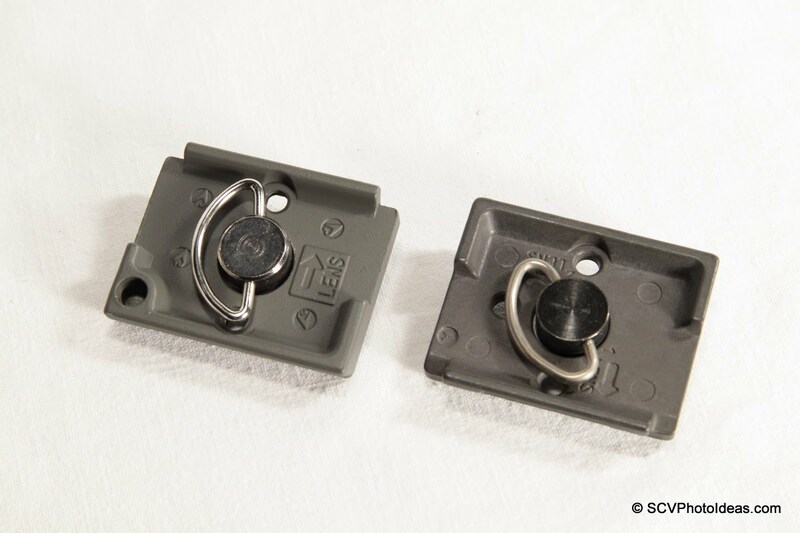 This means, that anyone that has invested in 3157N / 200PL-14 quick release plates can jump into the Arca system gradually, being able to use the old plates until they are replaced with Arca compatible ones. Or plainly use both systems simultaneously for different applications. One might expect this to be an expensive solution, but it comes in an unbelievably low price. DBA-1 comes in a small plain white box with a model and code sticker. It is wrapped in an air-bubble bag and is accompanied by a good quality 3/8"-16 to 1/4"-20 reducer bushing. First impression when unpacking and holding DBA-1 in your hands is of a sturdy ,very well machined and finished, quality product. So well made, that if I weren't aware of the price tag, I would have though that it costs twice as much. The clamp is made totally out of Aluminium with no rubber parts. A simple design with flat surfaces, two deep safety-screw relief grooves on the sides and a countersunk hole in the center which is also threaded 3/8"-16. In one of the grooves lies one clear bubble level, for those that need one. 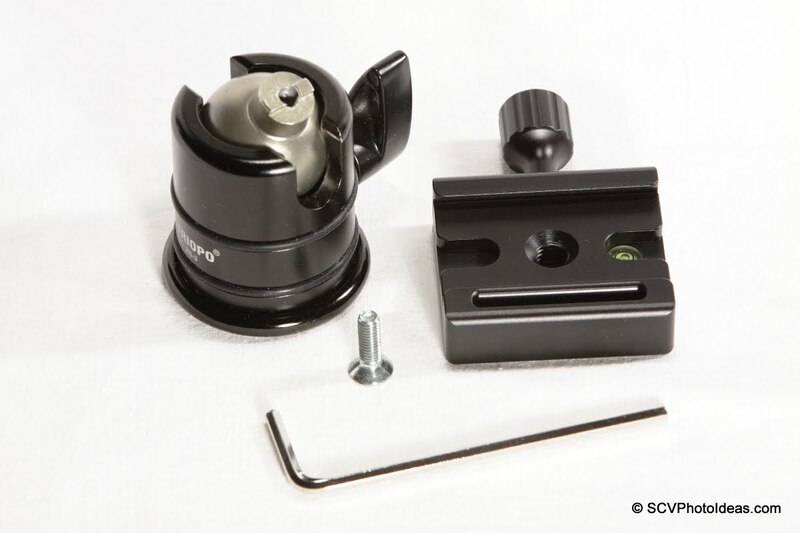 The 33mm long, captive screw knob is of one piece design, with a grooved surface for good handling even with gloves. Nothing innovative so far, as I left last, the long and deep groove on the stable jaw. This groove is what makes the clamp differ. 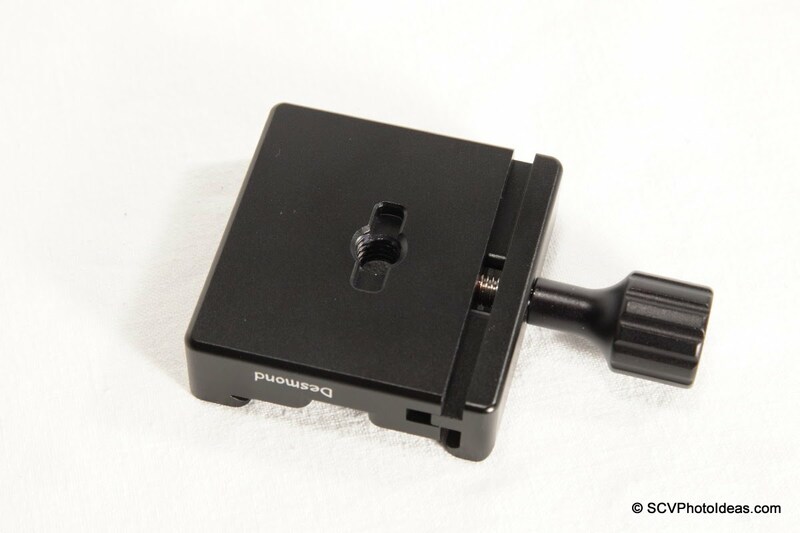 The deep groove can accept the front end of Bogen 3157N or a Manfrotto 200PL-14 or 38 plate! The bottom is flat, equally well finished, with obvious now the center hole 3/8"-16 thread and the alignment/anti-twist grooves for certain types of ball heads. The moving jaw tongues are classic in design, from end to end letting a small glimpse of the push-back springs when opened. The jaw opens and closes very smoothly via the screw knob, due to the very small tolerances and the thick silicone-grease. Desmond DBA-1 with its colleagues. A 6cm Arca compatible plate and two almost identical 200PL-14 plates I received together with the clamp for evaluation and review, from Desmond Photographic Distribution. One is an original Manfrotto plate and the other a Desmond branded plate. Given the opportunity I put them side by side for a quick comparison. The comparison of the Manfrotto vs the Desmond plate shows only some small differences. What actually differs is the texture of the anti-twist rubber sheet on top and an extra hole for a DV recorder pin present on the Manfrotto plate on the right. 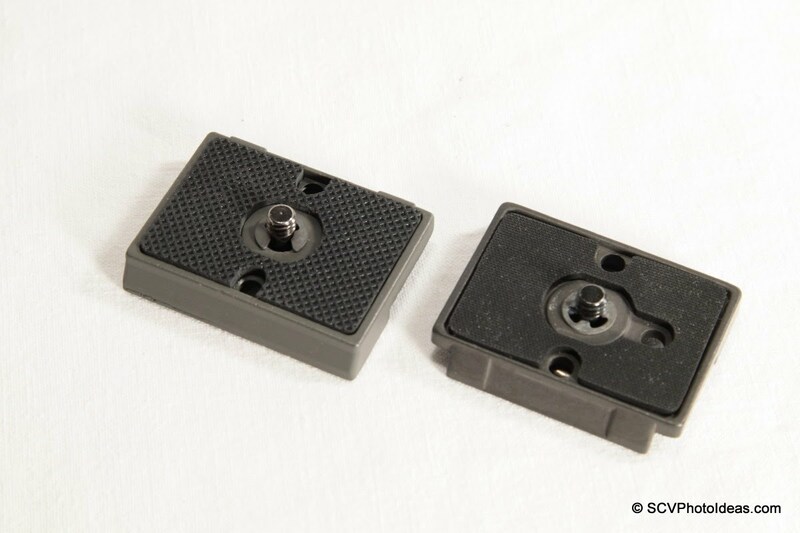 The bottom is almost identical too, with both plates having lens orientation marks and big D-ring 1/4"-20 screws. However, the main difference between the two is the price being far lower for the Desmond. Virtually any ball head with the appropriate anti-twist bosses on top of its ball stem can accept the Desmond DBA-1. With the use of an M6 flat-head hex screw and an Allen hex key the clamp is aligned and fixed in place. Using with an Arca compatible plate. The clamp can accept Arca compatible plates from 5cm long with safety-screws attached, or even smaller without safety screws. The 6 cm plate pictured above can move in by 1 cm on each side for better alignment of the attached equipment. Better view of the plate's M3 safety-stop screw fitting nicely into the clamp relief groove. I'm staying a little on that as I consider this a benefit, since most low budget clamps do not have safety-screw relief grooves. 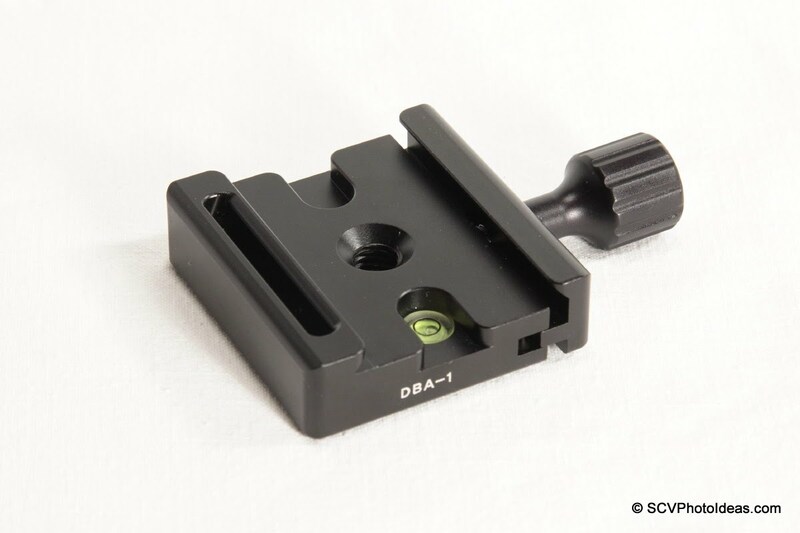 The DBA-1 quick release clamp was tested with various camera plates and lens plates, as well as with multi purpose long rails of various thicknesses and widths. Plates / Rails tested were from Benro, Kiwi Fotos, Fotoporo, Marumi and Hejnar PHOTO, with very good results. All dimensions fall within the average limits, consisting this clamp compatible with a large number of Arca-Swiss® compatible plates and rails. Using with a 200PL-14 plate. 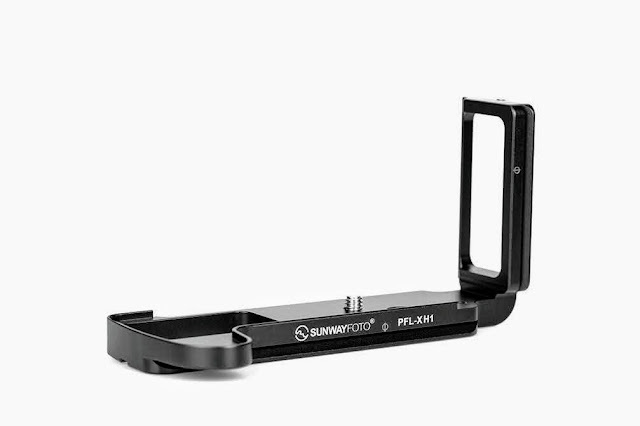 By inserting the front foot of the 200PL-14 plate in the clamp's groove one should only open the clamp for the plate to sit and then close the clamp tightening the plate in place securely. In the photo above right you may see both Manfrotto original 200PL-14 and Desmond replica fitting equally well and fixed within the clamp jaws. 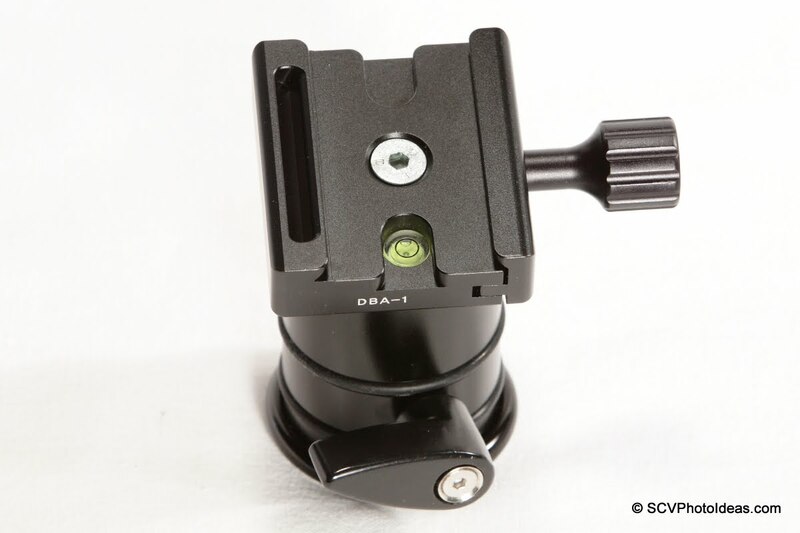 Owners of the older Manfrotto 48n series or newer 49n series of ball heads, that are equipped with an RC-2 quick release attached on the ball via a 3/8"-16 stud, may replace the RC-2 with the DBA-1 clamp and enjoy a gradual transition into the Arca-Swiss® compatible system. 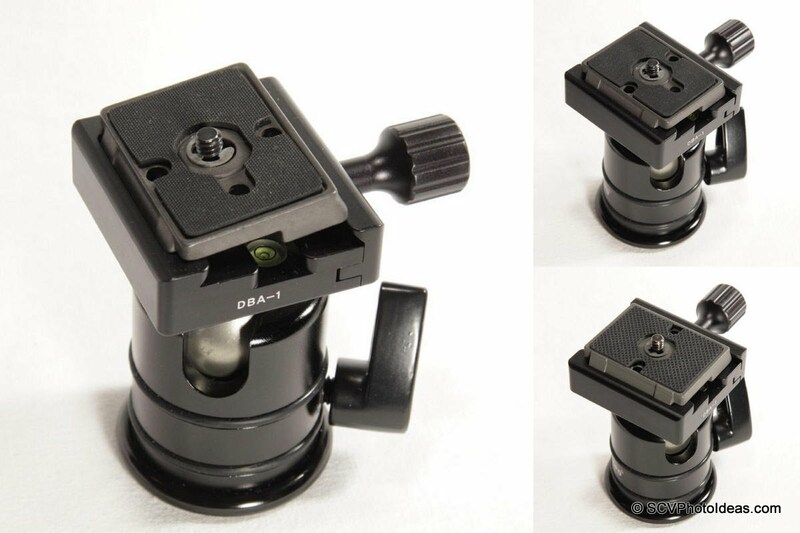 For example an older Manfrotto 486-RC2 ball head with its RC-2 quick release installed. Removing the RC-2 quick release, reveals the 3/8"-16 stud on top of the ball stem. With one-two drops of Loctite, Desmond DBA-1 may be attached and fixed on the stud directly. Unique and innovative design at a very low price. Exceptional machining, finishing and anodizing quality for the price. Excellent fitting with very low tolerances. I tried a lot to find flaws or something against this clamp but the only thing that I can find, is that its weight could have been a little lower, by removing some material from the clamp bottom. But on the other hand lowering the weigh -and that is only by a few grams- would involve extra machining and finishing time, which would subsequently rise the manufacturing cost substantially. 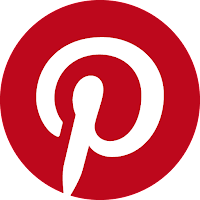 As I had mentioned in the past, a product should be judged according to the target group it is aimed upon. Therefore, considering the innovation and the quality standards offered, plus the fact that this clamp is targeting the low-budget market segment with a very low price tag, then I can only say it has an Exceptional Value for Money ! 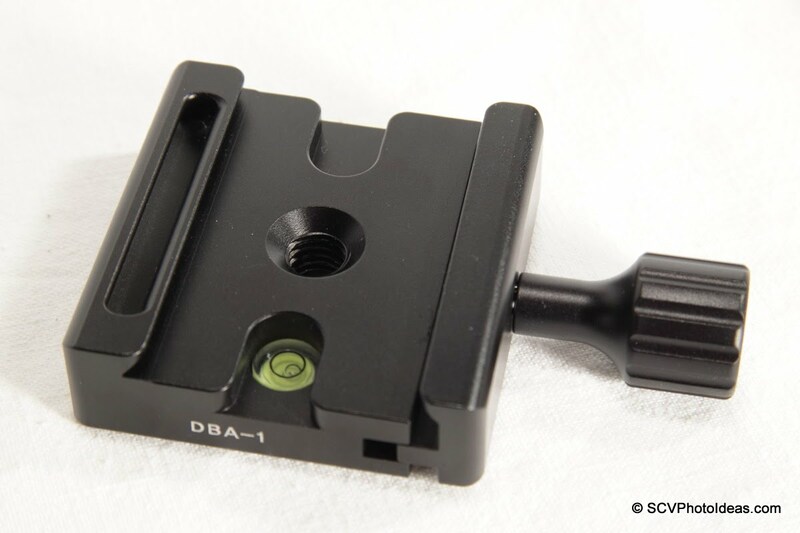 Note : The DBA-1 Bogen / Arca Clamp and the 200PL-14 plates presented in this article were kindly offered by Desmond Photographic Distribution, USA for evaluation and review. Amazing product. I was surprised to find that 200OL-14 plates are actually rock solid in the DBA-1, with zero side to side play. I consider the DBA-1 an improvement over the OEM RC2 QR. Hi Jeff, You're welcome and thank you too for sharing your experience and the info about the adapter. 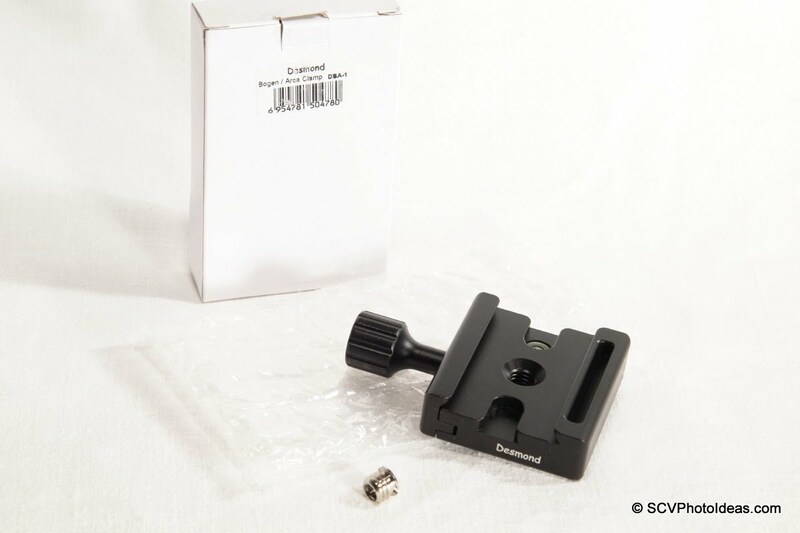 In this respect, I have published the Desmond Boss Adapter for Manfrotto 490 and 050 Series Ball Heads Review last month, where you can find more info and some illustrations.